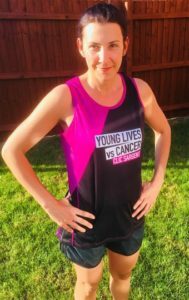 A member of staff at The Shrewsbury and Telford Hospital NHS Trust (SaTH) is preparing to run next week’s London Marathon in memory of her sister, who died from a brain tumour at the age of just 10. Lena Riemke-Maw, an Operating Department Practitioner (ODP) at the Trust will take part in the world famous race on 28 April in memory of her sister Leigh-Ann Maw. Lena will be raising money for CLIC Sargent, which supports young people with cancer. Lena said: “This cause is close to my heart having lost my sister to cancer when she was just 10-years-old after a two- year fight. Lena is one of four members of staff from SaTH taking part in the marathon. Joining her on the start line will be Nicola Bishton, Charlotte Worrall and Anne Ridgway. Nicola, a resuscitation officer at SaTH, which runs the Royal Shrewsbury Hospital (RSH) and the Princess Royal Hospital (PRH) in Telford, will be raising money for St John Ambulance. To boost her fundraising, Nicola has been teaching CPR in the community. Charlotte, a Breast Imaging Data-Coordinator at RSH, will be raising money for the British Lung Foundation in memory of her nan, Gwen Parker. Ann, a Pharmacy worker at PRH, is running to raise money for the Severn Hospice. She decided to enter to mark two milestones – the Hospice turning 30 and her turning 50.